We booked ourselves onto a very last-minute trip to Romania on Fly Dubai for Christmas, to return to Dubai for New Year’s Eve. Truth be told, we had a great flight with them to Bucharest – flight was half-full which meant we could put the munchkin down to her own seat to play, food was good, no issues with service. I’ll save my rant on the Fly Dubai Fog Fiasco in a separate post. As a whole, we had a great trip – our first ‘holiday’ with the 7-month old! Romania has some amazing landscapes, it reminded us somewhat of road-trips through New Zealand – just with a lot, lot, lot of snow. 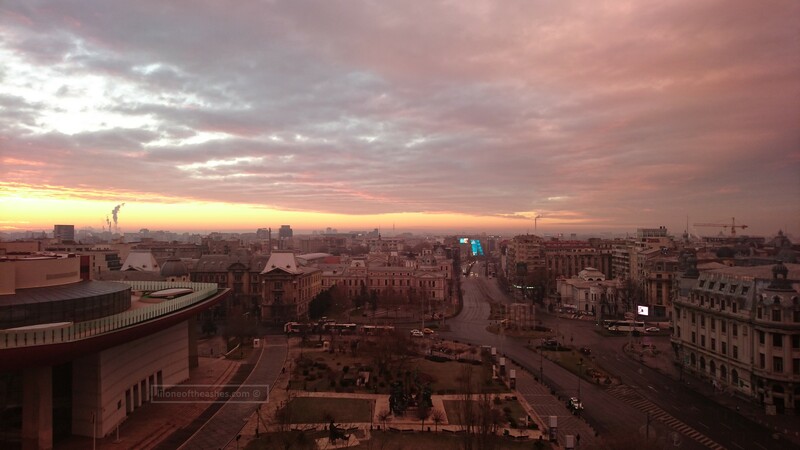 Sunrise over Bucharest, from the Intercontinental Bucharest Junior Suite on the 8th floor. The skies changed from dark blue, to blue, to purple, to pink. Beautiful. Click here for a review of our stay in the hotel. 2. 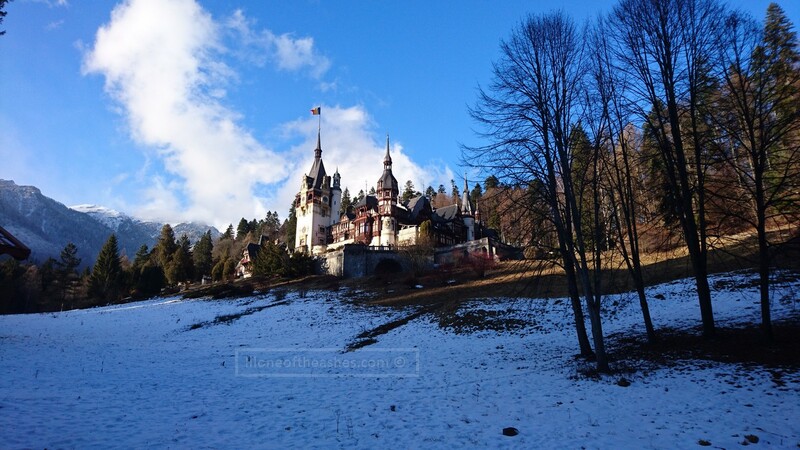 The first peek of Peles Castle as we walked up towards it, located on the Carpathian Mountains near Sinaia. Blue skies, the sun shining onto the castle – lighting it up whilst the snow around, hidden in shadows. Ah, it was breathtaking, really. We spent sometime here admiring the architecture, taking a million family photos around the courtyard. Cost : 10 lei for carparking, and it is a short 10 minutes walk to the castle. We ran out of time to go into the castle : there is an entry fee. 3. The lookout point over the town of Busteni, en route to Brasov, with the towering Carpanthian ranges beyond. It was snowing heavily, we wished we could stay on a little longer to take photos as then lights came on but it was too cold. 4. Lookout point of Brasov town, halfway up to Poiano Brasov. How I wish it was clear blue skies then! 5. 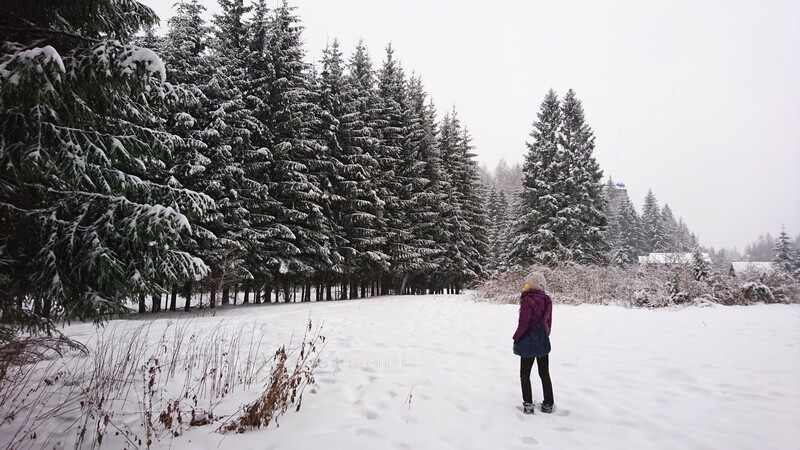 Wandering through the parks in Poiano Brasov whilst it was snowing, snow in some parts knee dip, admiring the pine trees. Santa must come from here! And according to the husband, great snowboarding as well. Cost : 12 lei for full-day parking on one of the side-streets. Some areas charge 10 lei/hour, so make sure you find somewhere reasonable! 6. 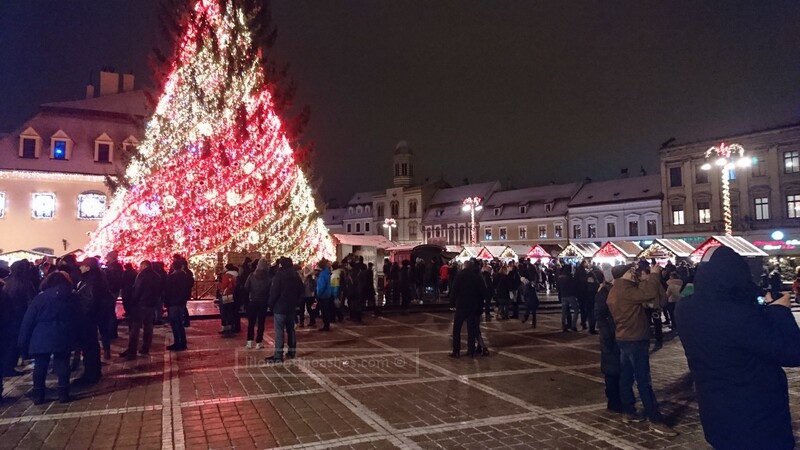 Christmas markets in the Brasov Square. A real pine tree for christmas, ha! Lots of mulled wine and Romanian treats. Cost : Free to visit. 7. 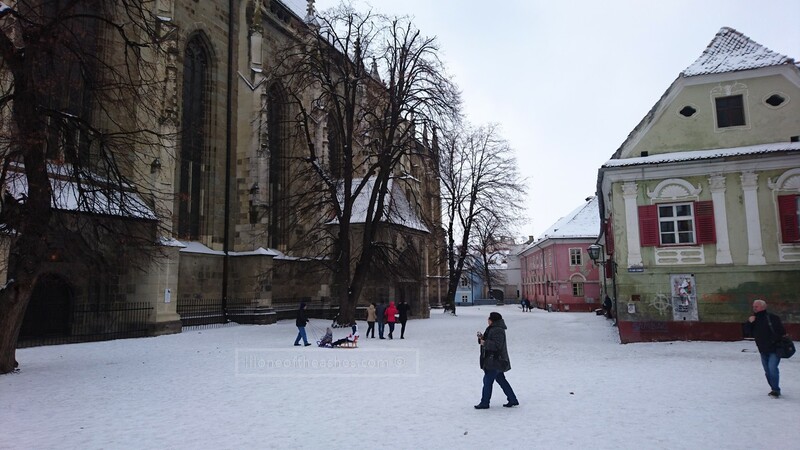 Wandering through the old town of Brasov, with many parts covered in snow. Cost : Free to wander. Just put on a lot of warm clothes. 8. 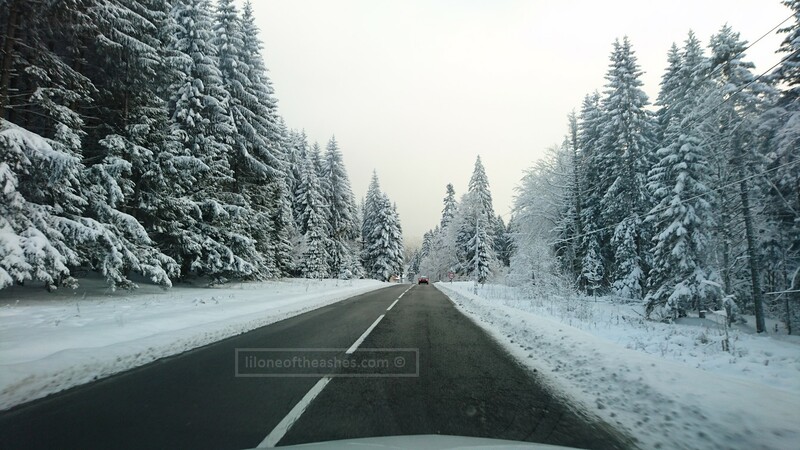 Driving through Rasnov, between Brasov and Bran (where Bran Castle is located). Another little town with colourful buildings, felt like you were in a tiny wonderland. 9. The landscape between Rasnov and Bran. 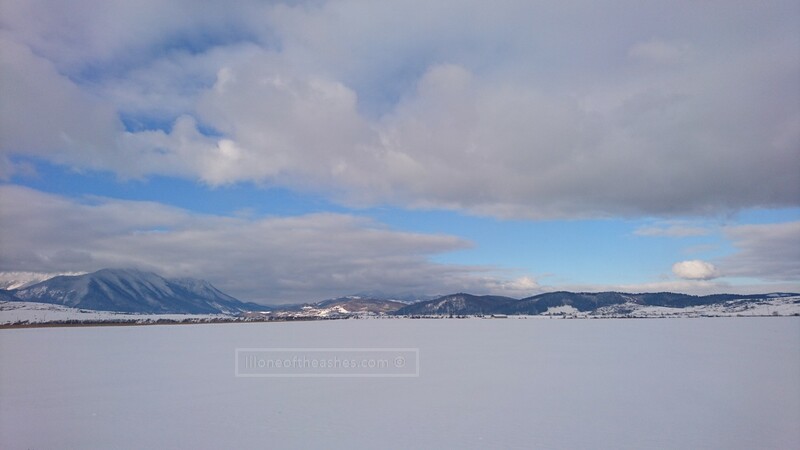 Large plains, all covered in snow. 10. 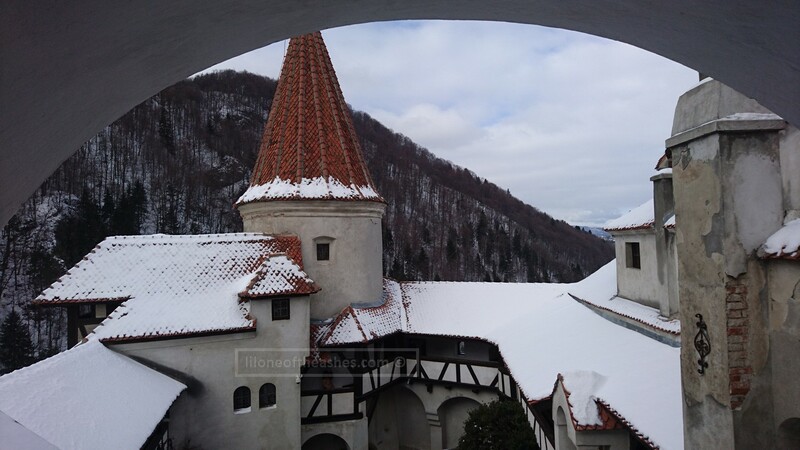 The view from Bran Castle aka Dracula’s Castle. Unfortunately we didn’t spend too long in this castle as the munchkin didn’t like it very much. 11. Highlight of the entire trip, the drive between Busteni and Bucharest. There is one stretch as you come down the mountain and the trees tower above you, all the branches and foliage covered in snow. It was so beautiful (I must’ve used this word a million times now). Video to be uploaded onto youtube soon. I’m surprised not many people have been to Romania, or speak much of it. Food and drinks are relatively cheap (we went to a restaurant in Brasov and had fine dining, drinks, soup, mains all for less than 150 AED total). We would’ve stayed for dessert if somebody didn’t wake up and threw a tantrum halfway through, he he. Reviews of the hospitality and food side of things, to come. *Disclaimer : We paid for flights to Bucharest, using Fly Dubai – around 1600 AED return (it was cheapest to fly out on Christmas Day and return on New Years Eve. We rented a 4wd as well for around 400 Euros for 6 days. Haha maybe munchkin got bad vibes about Dracula at the castle! Haha yeah. Wanted to leave as soon as possible!! Anyway, great post! I am thinking of Bucharest as well as Fly Dubai flies there. I’ve been using them to save up on my trips. Morning Grace! I’ll do a proper post on how it was like travelling with a little one, this was a sneak peak I guess hehe. It was ok driving around Romania, the roads are well kept and they pour salt on it to melt the snow to ensure it wasn’t slippery. We didn’t ask for a child seat as we brought her capsule (she’s 7-months old). Yeah Fly Dubai is cheap isn’t it! Only have to hope there’s no fog I guess otherwise fight delays and cancellations. We bought a local sim so we had data and gps throughout the entire trip, something ridiculous like 30aed for 5gbs. Their connection was amazing, we could even Skype our parents when we were walking around the little town and in the cafes! When are planning on Bucharest? 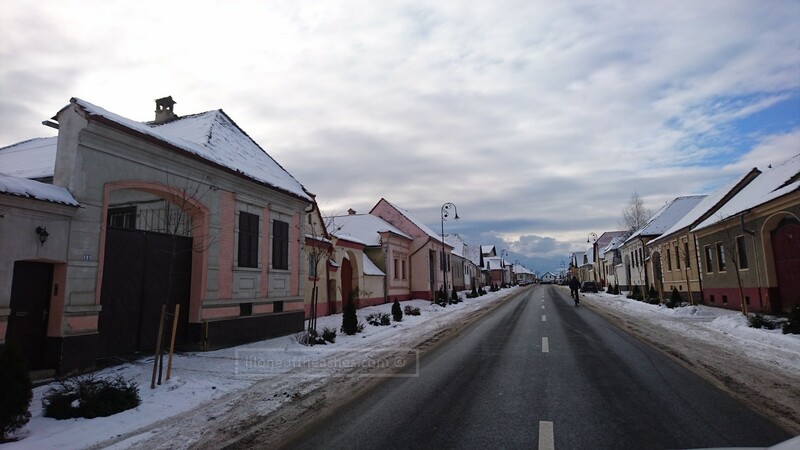 To be honest there’s more to see outside of Bucharest…the small towns outside of Bucharest, so I definitely recommend getting a rental car if you’re travelling with the kids! Yea, magical! Would be keen to check it out during other times of the year though. We didn’t make it Sibiu..unfortunately. I had to take it out of the itenary as we thought it might be too rushed as we were travelling with an infant. Didn’t make it to Sighisora either, I hear it’s really pretty there as well?? 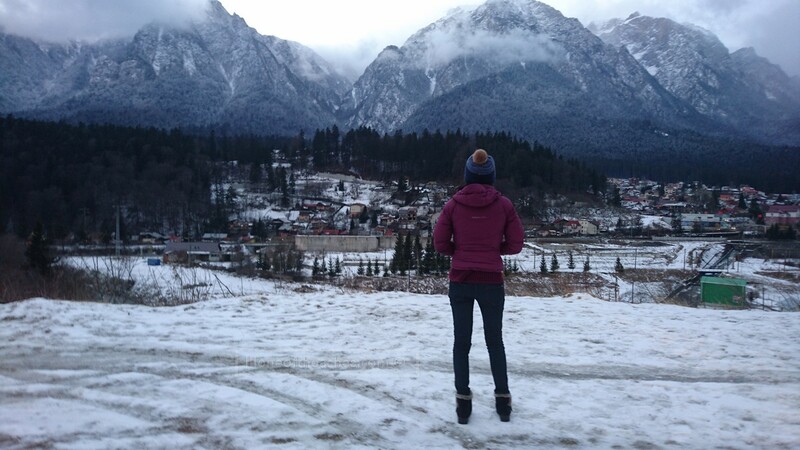 So in love with Eastern Europe for exploring so many (relatively) hidden treasures like Romania, Ukraine etc. Lovely articles like this hopefully help inspire people to take a chance, break away from the crowd and explore amazingly beautiful and richly cultured countries. Intercontinental? A top tip for city breaks if one is considering IC is to look into the Ambassador program. It’s a paid entry to IC’s own loyalty program, but it gives you instant Gold for any IHG property in the world (Crowne Plaza, Holiday Inn, Indigo and many more) as well as a free weekend night voucher. So for around $200, one could cash in the amazingly good IC Kiev (350 Euros usually a night) or 400-500 GBP IC Park Lane London etc. 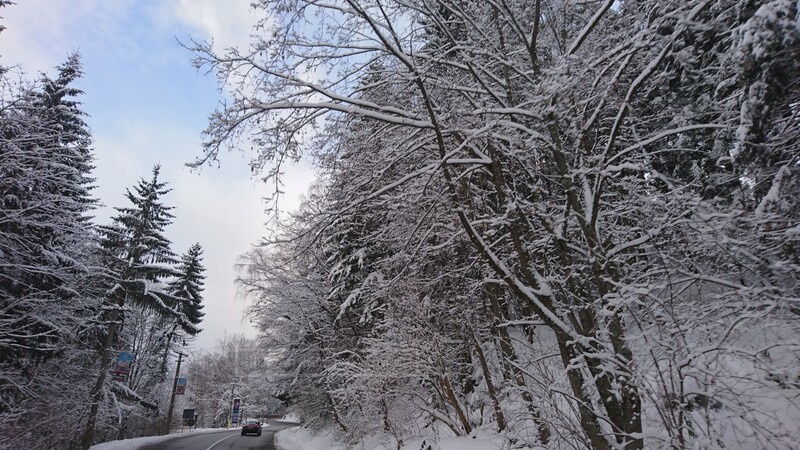 Just love your snow pics, any chance of you putting any more up – they’re lovely! Ukraine sounds like another good spot to go to – have you been?? Yea we’re hoping that people would be inspired to check out Romania – it’s so cheap to fly there with FlyDubai and so beautiful! Thanks for the tip on Intercontinental! You’re the pro on this!! I have so many photos of Romania and the snow – just might do one or two more posts on it then 🙂 🙂 Thanks!